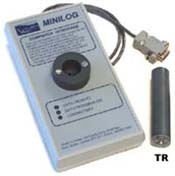 The Minilog is a rugged miniature temperature and depth logger that stores more than 8000 readings in nonvolatile memory. The temperature and optional depth transducer are mounted in one end of the Minilog, while an infrared LED transistor, used to transfer data from the Minilog to the PC interface, is mounted in the other end. The infrared LED transistor eliminates the need for expensive and unreliable waterproof connectors, and indicates the Minilogs' operational status to the user. A temperature only model - ideal for short and long term water temperature monitoring applications, and a combination temperature/depth model - ideal for sampling and fishing net depth monitoring applications are available.